When thinking of witch trials in Norwegian history, the case of Lisbeth Pedersdatter Nypan and her husband Ole often springs to mind. The case was brought to international attention with the publication of Rossell Hope Robbins’ Encyclopedia of Witchcraft and Demonology (1959). The story of the wise woman Lisbeth and the drunkard Ole, who threatened his enemies with his wife’s magical powers until the law caught up with them, is dramatic (as witch trials always are), but was not unusual compared to other cases in the country. The ageing couple, who owned a farm at Leinstrand in the modern day municipality of Trondheim, had their estate confiscated and were both executed in September 1670. Then the case was closed. However, the memory of Lisbeth Nypan has survived in the public imagination, and she is something of a Norwegian ‘national witch’, surrounded by numerous myths and stories. In recent years fictional tales, local historical and genealogical books, yearbooks, and encyclopaedia articles have told her story; in 2005, she was even memorialised with her own statue in front of Nypvang primary school in Trondheim. 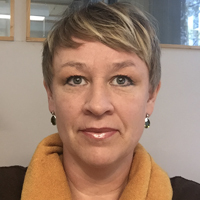 Ellen holds an MPhil in History and is currently Senior Research Librarian at the Gunnerus Library of the Norwegian University of Science and Technology. Her book Trondheums siste heksebrenning, a case study of the witch trial of Finn-Kirsten Iversdatter and its aftermath, was published in 2014.